Additional administrators can share the workload of managing a Facebook Page. Having additional administrators on the Page helps ensure that someone replies to comments quickly. The last thing you want is to be left waiting for the only administrator of your Facebook Page to come back from vacation. Additional administrators can help promote your Facebook Page through their personal networks. Click the Manage Admin Roles link from the Edit Page drop-down menu in your admin panel. Enter the e-mail address or name of the person whom you want to add as an admin. Click Save and in the pop-up window, enter your Facebook password to confirm the addition of administrators. 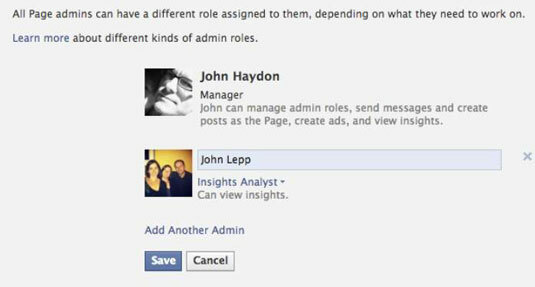 Manager roles have full control over your Page, so make sure you know this person very well!